Including childhood asthma in the report was a “no-brainer,” said Cristina Garmendia, who served as the Equity Indicators project manager. When black children suffer from untreated asthma, it can make it harder for them to catch up in other areas where their white counterparts have an advantage, Garmendia says. The condition is one of the leading reasons why children miss school, and chronic asthma can keep kids from exercising or playing with other kids. Asthma is a chronic condition that causes inflammation of the lungs. While it’s a genetic disorder, it’s exacerbated by environmental triggers such as air quality, mold and stress. The single indicator assesses more than one problem, Garmendia says. It not only measures the prevalence of asthma, it also shows how severe or under-treated the condition is in the city’s black residents. The findings aren’t surprising, said Marjorie Moore, director of the Asthma and Allergy Foundation’s St. Louis chapter. The foundation helps pay for prescriptions for low-income people with asthma, and Moore says the majority of the people they help are African-American children. 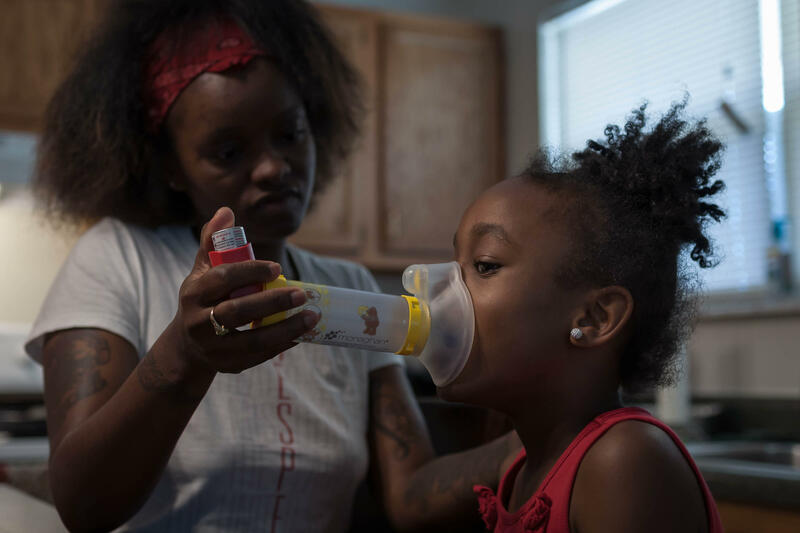 The struggles black children have with asthma indicate many black families can’t afford regular trips to the doctor and daily medications needed to treat chronic health issues, Moore said. If families manage their children’s condition with doctors’ visits and daily medicine, it’s very unlikely they’ll have a serious attack that requires a hospital visit, she said. “If your asthma is controlled, it’s far, far less likely you’re going to have an asthma attack that will send you to the ER,” Moore said. According to a spokeswoman from St. Louis Children’s Hospital, 86 percent of the 440 children who visited the hospital’s emergency department due to asthma in the last six months were African-American. Asthma can also be triggered by subpar living conditions and poor air quality, Moore said. Housing conditions such as dust and mold can trigger serious attacks. The Equity Indicators Project is a regional collaboration between the City of St. Louis, Forward Through Ferguson, and United Way. It’s funded by the Rockefeller Foundation. Original story from June 14; updated with audio from St. Louis on the Air June 15. Demolition and excavation work for a new federal intelligence agency headquarters in north St. Louis received environmental scrutiny and regulation that officials said is “above and beyond” what’s required. When some of that demolition material from the site of the National Geospatial-Intelligence Agency’s West headquarters was moved across the street, and next to a public school, little if any monitoring occurred. Parents and staff at the Gateway school complex on North Jefferson Avenue, point to the 30-foot piles of rubble they say brought high levels of dust and caused breathing problems and other ailments at the school over several months.